Mims’ Microbiology makes it easy for you to learn the microbiology and basic immunology concepts you need to know for your courses and USMLE. Using a clinically relevant, systems-based approach, this popular medical textbook accessibly explains the microbiology of the agents that cause diseases and the diseases that affect individual organ systems. 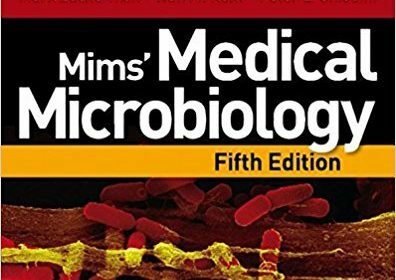 With lavish illustrations and straightforward, accessible explanations, Mims’ Microbiology makes this complex subject simple to understand and remember. Learn about infections in the context of major body systems and understand why these are environments in which microbes can establish themselves, flourish, and give rise to pathologic changes. This systems-based approach to microbiology employs integrated and case-based teaching that places the “bug parade” into a clinical context. Effectively review for problem-based courses with the help of chapter introductions and “Lessons in Microbiology” text boxes that highlight the clinical relevance of the material, offer easy access to key concepts, and provide valuable review tools. Approach microbiology by body system or by pathogen through an extensively cross-referenced “Pathogen Review” section. Access the complete contents online at studentconsult.com, along with downloadable illustrations…150 multiple choice review questions… “Pathogen Parade”…and many other features to enhance learning and retention. Enhance your learning and absorb complex information in an interactive, dynamic way with Pathogen Parade – a quickly searchable online glossary of viruses, bacteria, and fungi. Deepen your understanding of epidemiology and the important role it plays in providing evidence-based identification of key risk factors for disease and targets for preventive medicine. A completely re-written chapter on this topic keeps abreast of the very latest findings.